Everyone is given a measure of Faith – the size of a mustard seed. Ever see one, it’s very small. It’s up to us to grow our Faith. We grow our Faith whenever we see GOD answer prayers. 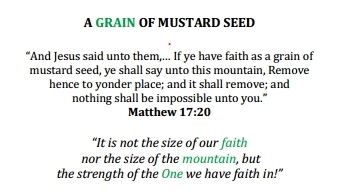 So, if everyone is given faith as a mustard seed, how much has yours grown? How many people have put their faith in other things and not in JESUS? Faith can and will move mountains. Faith will remove the mountains in your life. That’s a promise from JESUS. Don’t let the enemy take your Faith away with his lies and false promises of a better life. Nothing good comes from him. He will always tempt us but it’s always our choice to fall into those traps. He knows our weaknesses and he’ll do anything to throw those obstacles in our paths. Focus on JESUS. You can’t lose. This has got to be the scariest thing that could happen to anyone. There are so many people not knowing JESUS. Not knowing the Truth. That’s why we’re big on having a strong relationship with JESUS. HE will get you to heaven. No one or nothing else. Do you know HIM and Love HIM with all your heart, mind, soul, and strength? James says, “faith without works is dead.” Works are to faith what the body is to the spirit. Our body shows the life of the spirit by our actions. Work shows our faith. The only way I can display that I am alive is with my body. The only way that I can display that I have faith is by my works. Having Faith in JESUS should have us do the works of the FATHER. Passing on the Blessing you get, feeding the hungry, praying someone back to health, for financial Blessings, for Peace, comfort, for GOD’S Grace and Mercy. For LOVE. JESUS wants to do mighty things through us. Are we willing vessels? Faith is believing that no matter how good things are, the best is yet to come.